-- w r" I"''I11 "
C. L. MARLATT, Assistant Entomologist and Acting Chief in Absence of Chief. R. S. CLIFTON, Executire Assistant. W. D. HUNTER, in charge of southern field crop insect investigations. F. M. WEBSTER, in charge of cereal and forage insect investigations. A. D. HOPKINS, in charge. H. E. BURKE, J. L. WEBB, JOSEF BRUNNER, S. A. ROHWER, T. E. SNYDER, W. D.
WILLIAM MIDDLETON, MARY C. JOHNSON, student assistants. O NT I N' S.
Favorable and unfavorable conditions for destructive work..
examined had been damaged, some more seriously than others. 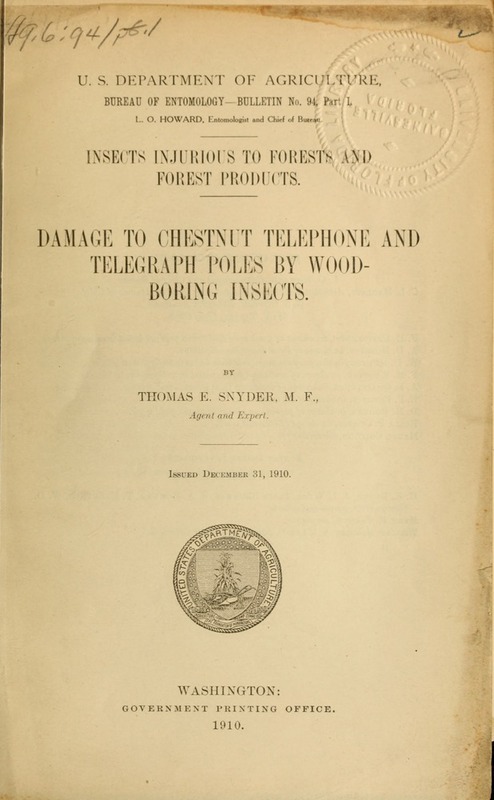 insect damage was the work of the chestnut telephone-pole borer. made the subject of a special investigation. August, 1910, in Virginia, where the poles were being reset or replaced. a Insect Depredations in North American Forests. Entomology, U. S. Department of Agriculture, p. 67, 1909.
pole borer rendered from 15 to 20 per cent of tlie poles unserviceable. poles were naturally in much worse condition, . decayed near the surface of the ground. damage by "wood lice" (termites) and also by "white wood worms." stout, cylindrical, so-called "round-headed" grub or "wood worm"
,H "-' a~ pletely worked out. Canada, to Texas, eastward to the Atlantic coast, and westward to . WORK OF THE CHESTNUT TELEPHONE-POLE BORER. trance plugged with excelsior-like wood fibers; work near base of pole, below ground. Fig. 2.-Mines of the chestnut telephone-pole borer near surface of ground. Natural size. DAMAGE TO CHESTNUT POLES BY INSECTS. outer layers of the wood. near the line of contact with the soil. Often large, er: Pupa. Sometimes old dead parent adults are found on the natural size. poles below the ground surface. and thus prolonging its length of service. EXTENT OF DAMAGE AND LOSS. cent of the poles reset or replaced are injured by insects. FAVORABLE AND UNFAVORABLE CONDITIONS FOR DESTRUCTIVE WORK. conditions of drainage. Such sites are the crests of railroad cuts a! through low hills, slopes of "fills," and in cultivated or other fields. b See list of publications, page 11.
c The average life of a chestnut pole is eight to ten years (Sherfesee and Weiss, 1909). rapidly than poles that are in an absolutely sound condition. rendered unserviceable or their length of service is much shortened. in sound wood, "doty" (dry rot) wood, and "sobby" (wet rot) wood. in other instances heart rot is clearly present. cIdentified by Mr. Theodore Pergande of this Bureau as TermnesfJlaripes Kollar. of this Bureau by Mr. C. L. Marlatt. near the surface of the ground. and caused the poles to break off sooner than they otherwise would. heartwood near or just below the surface. outer layers of the wood. The work is often throughout "doty"
ing checks, enlarges other defects, and induces more rapid decay. b Identified by Mr. E. A. Schwarz, of this Bureau, as Polymncchus breripes Lee. c Identified by Mr. H. E. Burke, of this Bureau, as Buprestis rufipes Oliv. e Identified by Mr. Theodore Pergande as Camponotus pennsylvanicus Mayr. I Identified by Mr. Theodore Pergande as Cremastogaster lineolata Say. g Insect Depredations in North American Forests. U. S. Dept. Agr., p. 84, 1909.
contribute to the prevention of premature l deterioration and( decay. H 1910, in company with engineers of the telephone company adl Mr.
wood-boring insects, they will not keel) the insects out of thlie poles. The most serious damage to the poles in this line was by white ants. boring insects, at least for a five-year period, in this northern climate. There was but little damage by insects to the poles in this test line. a (Camponolus pen nsylh'anicus Mayr. with creosote and with "S. P. F." carbolineum remained uninjured. come right up through the pole. 12 INSECTS INJURIOUS TO FORESTS. 19 oetSri..
190S. ~ ~ ~ ~ ~ ~ ~ ~ ~ ~ .....'.. "11. "E-rgesi hsntplepeevto. 1903. rON SCHRENK, H.-Seasoning of timber. 1906. GRINNELL, H.-Prolonging the life of telephone poles. lYewbq. t ..... ..
Dept. Agr. for 1905, Extract No. 395. 1907. CRAWIFORD, C. G.-Brush and tank pole treatments. 1907. GRINNELL, 11.-Seasoning of telephone and telegraph poles. Service, U. S. Dept. Agr. 1908. SHERFESEE, WV. F.-A primer of wood preservation. 1908. WEiss, II. F.-Progress in chestnut pole preservation. 1909. SHERFESEE, W. F.-Wood preservation in the United States. 1909. SHERFESEE and WEIsS.-Wood preservation. 1909. KELLOGG, R. S.-The timber supply of the United States. Service, U. S. Dept. Agr., pp. 20-21. 1910. WILLIS, C. P.-The preservative treatment of farm timbers. 387, U. S. Dept. Agr. .. : .. .. .
.m .... i? .:... .. .:?